“Table saw” is an inclusive term. 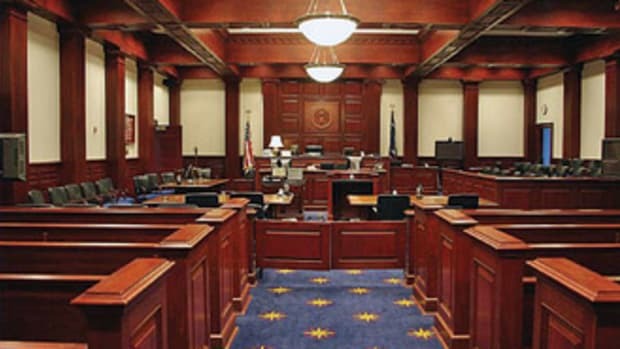 It embraces everything from large sliding versions to cabinet, contractor and portable job-site units. So identifying trends across all of these categories can be a bit overwhelming. Let’s begin with larger industrial saws. Here, innovation seems to be happening in two main areas: more complex, yet easier-to-use, controls and improved ergonomics. More manufacturers are moving their control interface from the body of the saw to a swivel arm and, as more functions become automated, the programs are actually becoming simpler and easier to use. 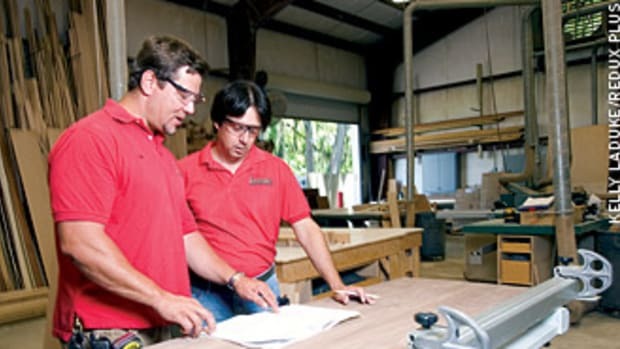 Take, for example, Martin Woodworking in Charlotte, N.C. (martin-usa.com). The parent company is located in Ottobeuren, Germany, so the saws are built to traditional European engineering standards. 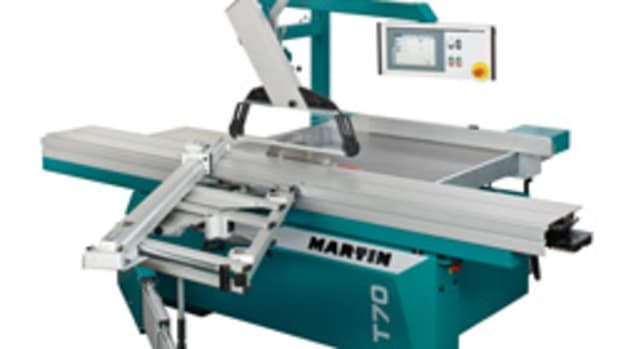 Martin’s approach to controls is encompassed in one of the company’s slogans: “Let the machine do the calculations.” Its RadioCompens system asks the operator to set the radio-controlled miter crosscut table to the desired cutting angle and the machine then takes care of the rest. It delivers correctly calculated measurements, taking into consideration the kerf of the saw blade regardless of the blade’s width. If a woodworker needs to calculate a measurement from the top of a workpiece instead of the bottom, the operator can touch one button on the controller and the new measurements will be displayed. Another optional feature is what Martin calls a fourth axis, which describes motorized automatic stops for crosscutting. Altendorf (altendorf.com/en) has revamped its F45 line and the new look embraces both modular and versatile solutions. The redesigned control module is at eye level, can be swiveled and comes in three different packages that let a woodworker decide just how versatile the saw needs to be. Options include automatically correcting the positioning of the rip fence when the saw unit is tilted, controlling the vacuum clamping system in the sliding table (which can securely hold large workpieces), and remembering up to 999 memory settings. And the company’s ElmoDrive option can be linked to a cut-optimization package. 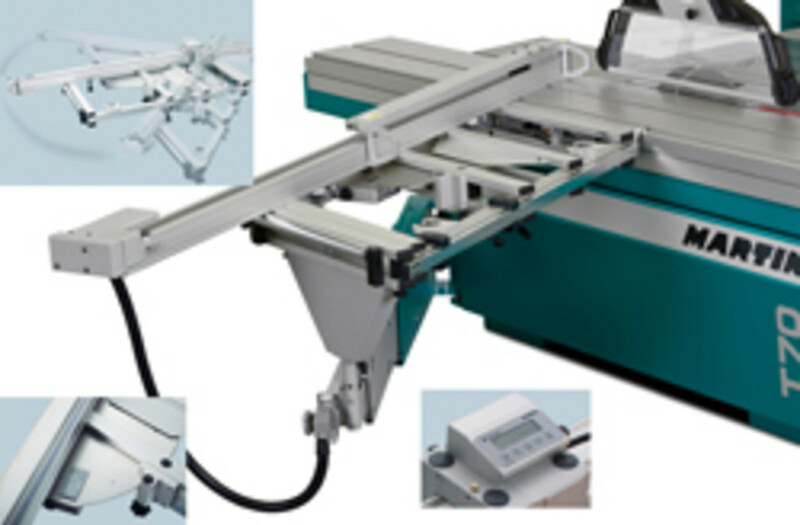 The two top-of-the-line saws from Austrian manufacturer Felder (feldergroupusa.com) also have control panels on swivel arms for maximum ergonomics and the Format 4 line’s Kappa 550 “e-motion” model has infinite storage space for programmed cuts. Felder offers 16 models of sliding saws under its Format 4, Felder and the budget-conscious Hammer branding. That trend toward more electronic control is also evident in Baileigh Industrial’s three versions of its slider, the STS-14120. 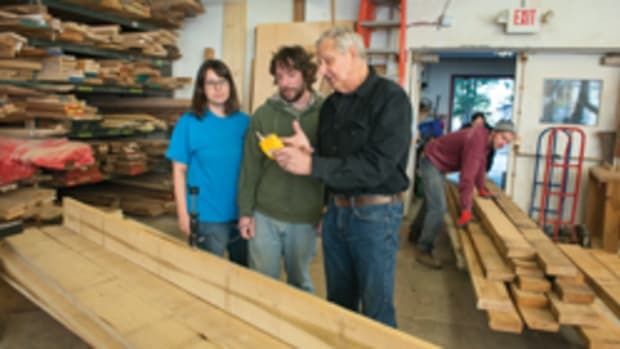 The company (baileigh.com) offers its DRO model with digital readouts on the fences and a CNC model that lets the woodworker store cut programs. 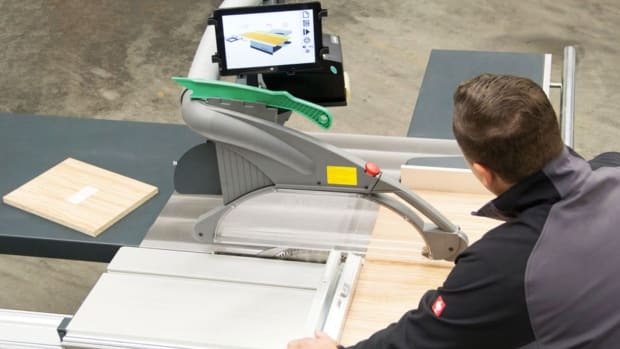 Robland (robland.com) builds table saws in Bruges, Belgium and its Silverline PS3200 X slider has touch-screen controls plus digital readouts on two flipper stops on the crosscut fence. With ergonomics in mind, this machine also comes with a moveable on-off switch for the blade and the scoring unit. Laguna Tools (lagunatools.com) offers the PP16/XC, featuring a rip fence that is controlled by a high-precision ball screw and a DC motor. The overhead control panel features a digital readout for the rip fence and, with ergonomics in mind, the arm is extended to make it easier to reach when working with larger panels. The Si X L’invincibile sliding saw from SCM/MiniMax (scmgroupna.com) has a sliding table structure with special, patented, ground-arch steel guides. The saw has a telescopic swinging arm that’s composed of a large dimensioned extrusion with a linear guide on recirculating ball bearings. And, once again, the Easy Touch control panel is at eye level to help make life a little easier for the operator. Cantek America Inc. (cantekamerica.com) offers half a dozen sliders, two of which have eye-level control panels. The D405ANC comes with a programmable rip fence (up to 51”) with a precision ball screw. Not every shop can afford state-of-the-art electronics and programmable fences and there are many saws available that deliver exceptional results for a smaller investment. Among them are the Active 400 from Biesse (biesse.com), the SF-45A from Silver Machine (silvermachineinc.com), and the 9610 from Oliver (olivermachinery.net). All of these offer body-mounted controls and manual stops, as do the three families of Italian saws from Paoloni that are available from AMC Machinery Parts in New Milford, Conn. (amcmachineryparts.com). Italy’s Casolin (casolin.com/en) builds four sliding table saw models in this genre and Grizzly Industrial (grizzly.com) carries eight sliders, including model G0772 with a digital console to control blade speed, height adjustment, blade tilt and scoring blade alignment. It accommodates both 12” and 14” blades and is powered by a 10-hp main motor (single or 3-phase), plus a 1-hp scoring blade motor. Taking control a step farther, the Italian manufacturer Griggio (www.griggio.com/en) offers the “Unica Safe” sliding saw that incorporates technology akin to that in SawStop models. This kind of device will definitely become a more widespread trend in the next few years as insurance carriers grow more familiar with it. Where that leaves woodworkers is anyone’s guess. It seems reasonable to assume that overseas manufacturers of larger saws will either license SawStop technology or develop new safety products that don’t violate the design copyright. Many woodshop owners would like to see a device that drops the blade below the table, but doesn’t become lodged in a block of aluminum, so that both blade and block need to be replaced every time the device is triggered. That’s how Bosch’s Active Response Technology platform works: it doesn’t damage the blade and, after activation, it can be reset in less than 60 seconds. The largest saw currently offered by SawStop is a 10” cabinet model with a fixed table. Here, the trends are making riving knives, blade guards and splitters easier to use; providing locking arbors for easier blade changes; installing better drive belts for more efficient power transfer; and, in some cases, designing better sawdust extraction. Some of the bigger saws are also getting even heavier and more impervious to vibration: the 14” PM2000 from Powermatic, for example, weighs in at a healthy 750 lbs. Coming out of a long recession, woodworkers have changed the way they think about machines such as basic table saws. During the years when replacing equipment wasn’t so easy to do, woodshops began to harken back to an attitude that was more prevalent in prior generations — among those who had witnessed the Great Depression and the shortages of the war and post-war years. In the last decade, there has been an emerging trend toward taking better care of the machines already owned and performing more routine maintenance. Advances in dust collection and air scrubbing are part of that, as is the inclination toward lean manufacturing where stoppages and breakdowns are intolerable interruptions. Shops are rediscovering routines that involve checking blade and fence tolerances with micrometers; coating surfaces regularly with protective lubricants such as SlipIt (a silicone-free coating that can be used around bare, unfinished wood); updating belts and pulleys from flat to V or segmented versions; replacing frayed or aged wiring and so on. 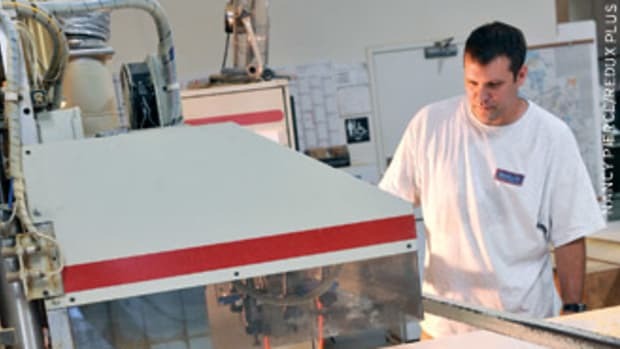 For shops looking for this type of machinery, the manufacturers of cabinet and contractor table saws (as well as benchtop versions for job-site work) include Black & Decker, Bosch, Craftsman, Delta, DeWalt, General International, Hitachi, Makita, Metabo, Powermatic, Ridgid, Rikon, Rockwell, Ryobi, SawStop, and Woodstock International/Shop Fox. Woodstock also offers a small sliding table saw, the W1811 (compare to the Grizzly G0623X), which is a 10”, 5-hp cabinet saw equipped with a scoring blade. This, too, could become a trend, bringing the versatility and repeatability of a slider to the hobbyist or very small shop — and doing so at an affordable price.